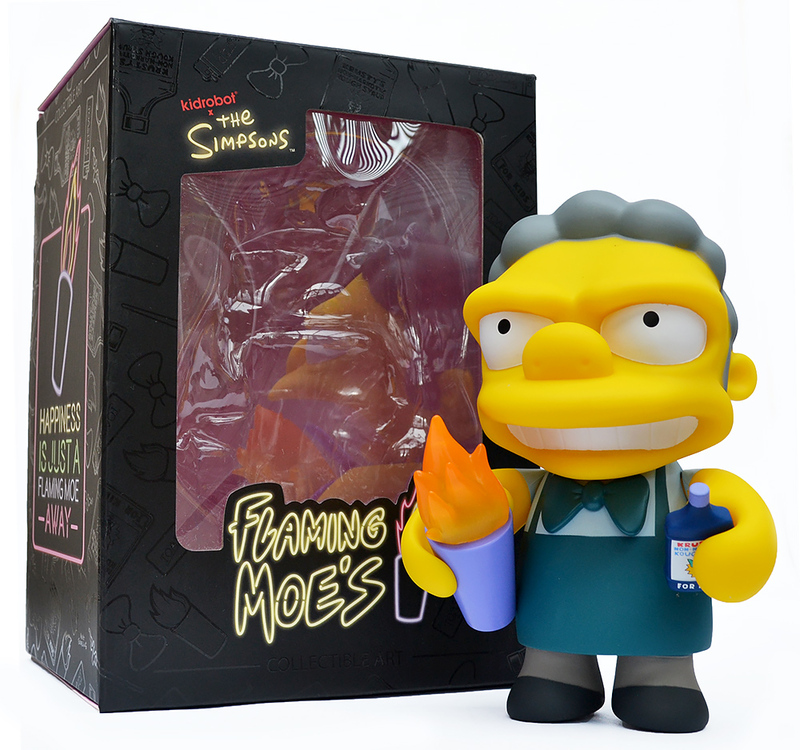 Reviewed: Flaming Moe’s by Kidrobot (2018) | 'TAIN'T THE MEAT… IT'S THE HUMANITY! Based on the classic ‘Flaming Moe’s’ episode of The Simpson’s, originally broadcast on 21st November 1991 (over 25 years ago! ), where a despondent, and broke Moe steals Homer’s secret recipe for a addictive alcoholic drink, which leads to fame and fortune for Moe and anger and insanity for Homer. It’s one of the all-time great episodes (it’s definitely in my top ten) and featured a guest appearance by rock band Arrowsmith, as well as some notable TV and movie parodies. The episode also marked the first time Moe played a prominent role in the show — the first of many. The back of the packaging… note the spot varnish illustrations on the box. 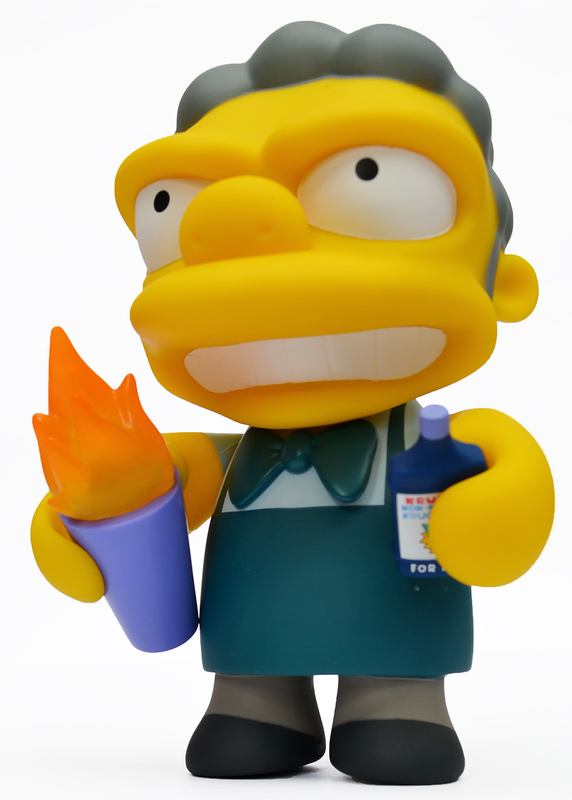 Flaming Moe’s by Kidrobot was released in June 2018 and features Moe immortalised in painted vinyl measuring an impressive seven inches in height; out of the dozen or so oversized Kidrobot figures in my collection Moe is easily one of the biggest. 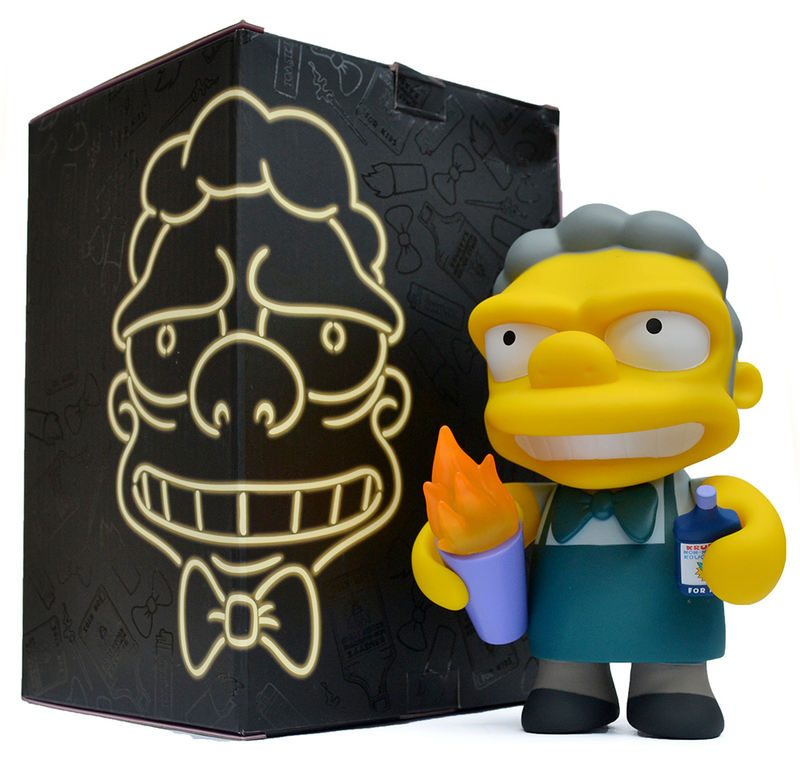 The toy ships in a sturdy cardboard box with a display window in the front, and Moe’s face as a neon sign on the back. Also adorning the box are illustrations printed in spot varnish, a nice touch. In my review of the oversized Gene/Beefsquatch figure from Kidrobot’s Bob’s Burgers range I mentioned my dissatisfaction with the somewhat uninspired packaging; happily I have no such complaints with the Flaming Moe’s box. 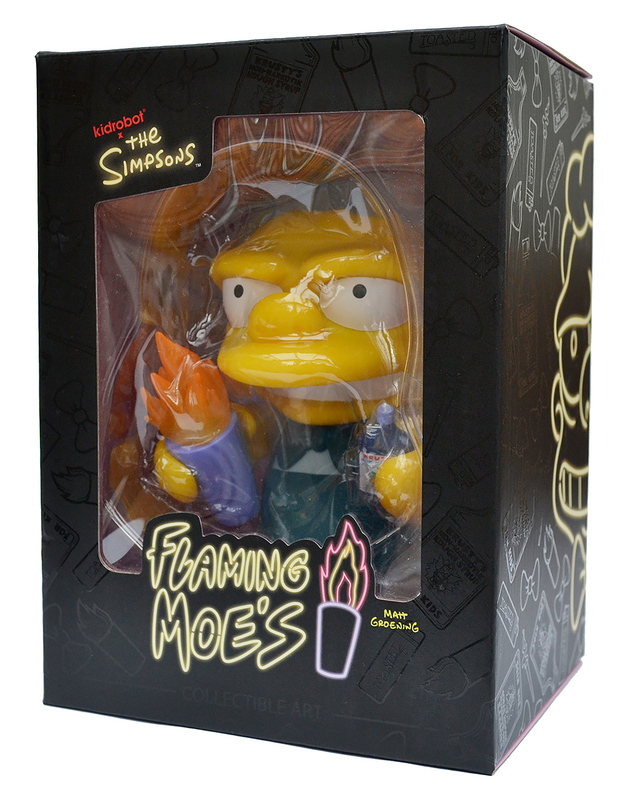 Moe comes with two accessories: a large glass of Flaming Moe (with flames, natch) and a bottle of ‘Krusty’s Kough Syrup’, the secret ingredient in Homer’s recipe. 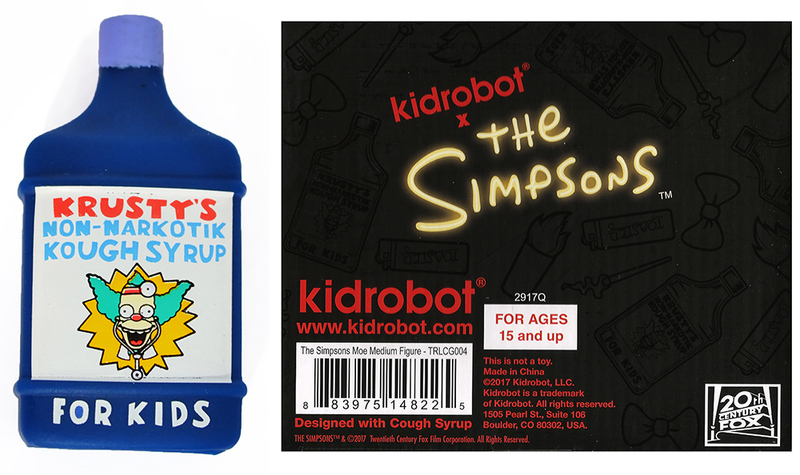 Flaming Moe comes with a bottle of Krusty’s Kough Syrup… and note the reference on the bottom of the box. 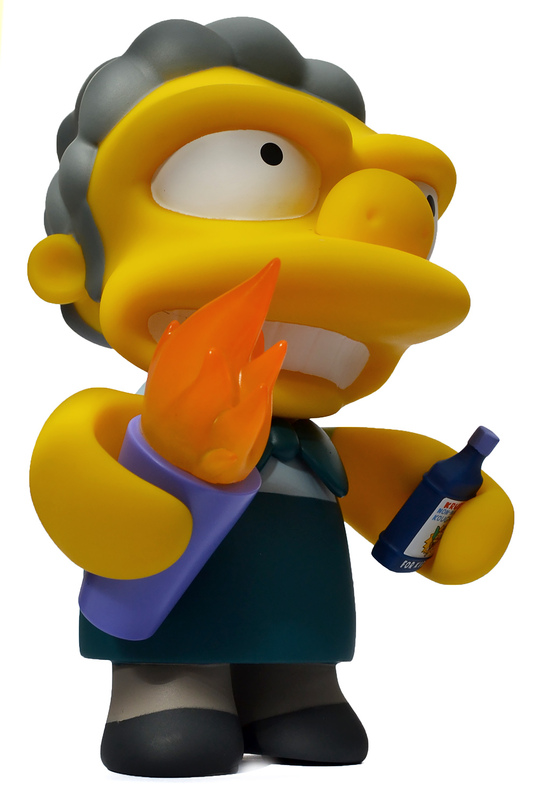 Flaming Moe is made from sturdy vinyl which, like all of Kidrobot’s oversized figures, has a satisfyingly chunky feel to it. 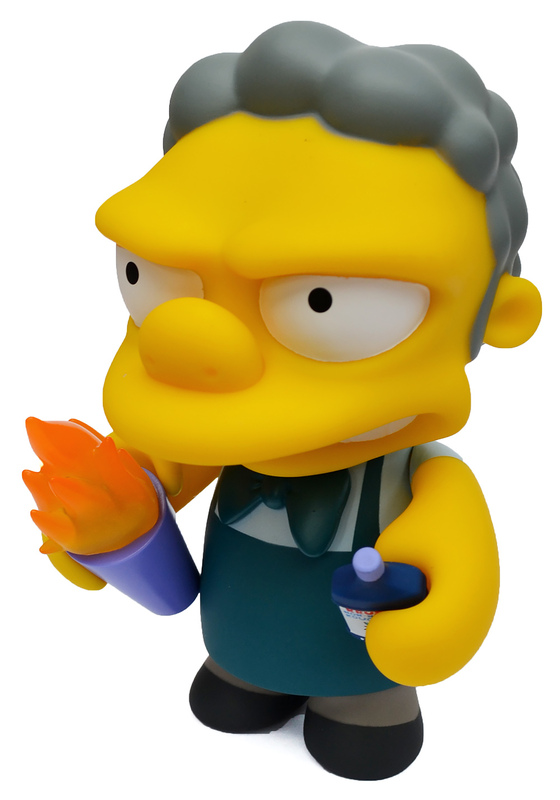 Moe also features three points of articulation — his head and arms both move. The paint work is very well done with no serious overlaps, and the colours are bright and punchy. Overall Moe demonstrates the same high quality and attention to detail we’ve come to expect from Kidrobot. Flaming Moe’s RRPs for $50, or £40 give or take a few quid, but hunt about and you’ll easily find one cheaper (I got mine from ebay for £28). Flaming Moe, from all sides. Regular readers of ‘Tain’t the Meat… it’s the Humanity will know that I’m a big fan of Kidrobot’s vinyl toys, both the three-inch versions and their larger counterparts. 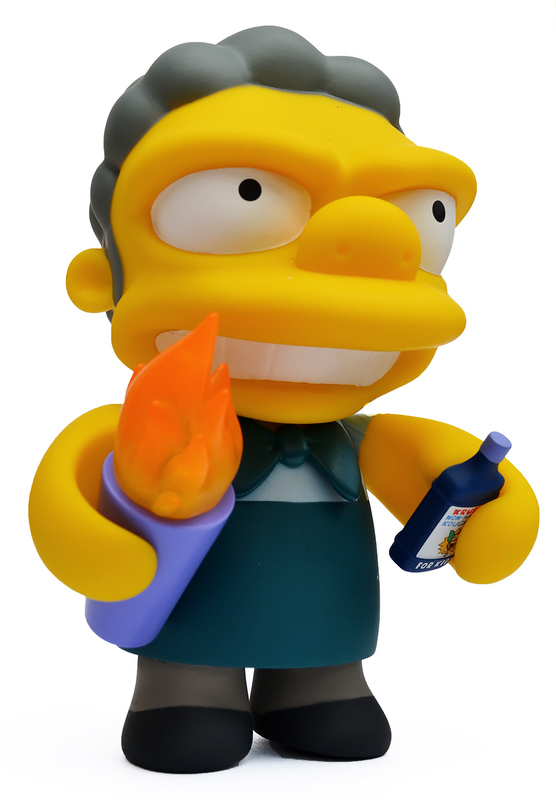 They’re well designed and beautifully made toys that just have great shelf appeal, and Flaming Moe’s is a welcome addition to my collection. Happiness really is just a Flaming Moe away. “The secret ingredient is… love? !”.